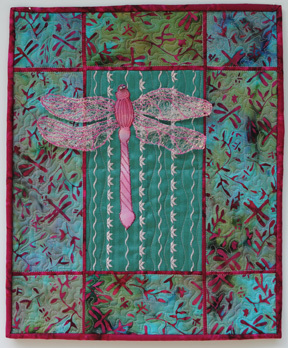 Explorations in Quilting and Life: Off the Wall! A group that I belong to, RAFA (Rochester Area Fiber Artists), will be having a show at the Arts and Cultural Council for Greater Rochester from March 2-29, 2012. The exhibit opening will be on March 2nd from 6-9:00 pm. 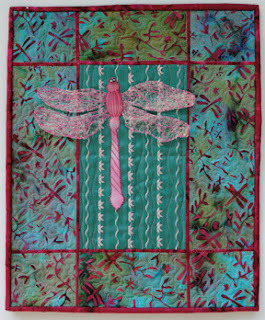 I am delighted that my art quilt, Dragonfly, will be in the show. While it will rest on the wall, a good number of the pieces are sculpture and clothing and are literally off the wall. A wonderful example is this vest by Anne Fischer, Gilet le printemps. The Arts and Cultural Council for Greater Rochester is located at 277 North Goodman St., Rochester, NY 14607. The exhibit will be open daily, Monday - Friday, from 10am - 4 pm. Hope if you are in the area that you can stop in! Both pieces lovely indeed and a teaser for spring. Wish I could be there. Have a great show!